The perfect piece to lounge outside. 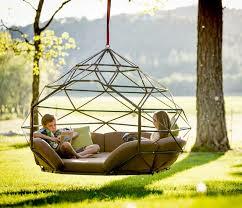 A pod that is fit for up to four people. The pod is hanging from a tree to make it slightly elevated off the ground. This will take your lounging to the xtreme!